This is the best protein shake ever! Seriously, you will think you are eating ice-cream. 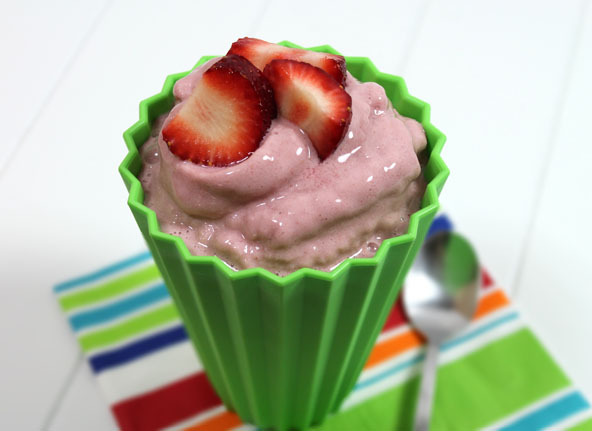 This is an over the top rewarding recovery shake to savor after a good work-out. It happens to be Raw-Vegan and Paleo approved. 1 scoop of Protein powder, vanilla or chocolate (I use a variety of good quality whey or egg white protein powders but my favorite Raw-Vegan plant protein powder is Sunwarrior). Pour the milks of choice into a high powered blender. Add the frozen strawberries or any other fruit you like. Add the protein powder, egg if using and sweetener of choice. Blend everything up except the crushed ice. Once everything is blended well, decide if you want to add the crushed ice. This is a personal preference. Its a lot of ice but my kids love it this way. Its a little tough on the blender but a Vita Mix blender and the Blendtec blender seem to handle it. You decide. Pour it straight into a large cup and enjoy it slowly or you will get brain freeze!